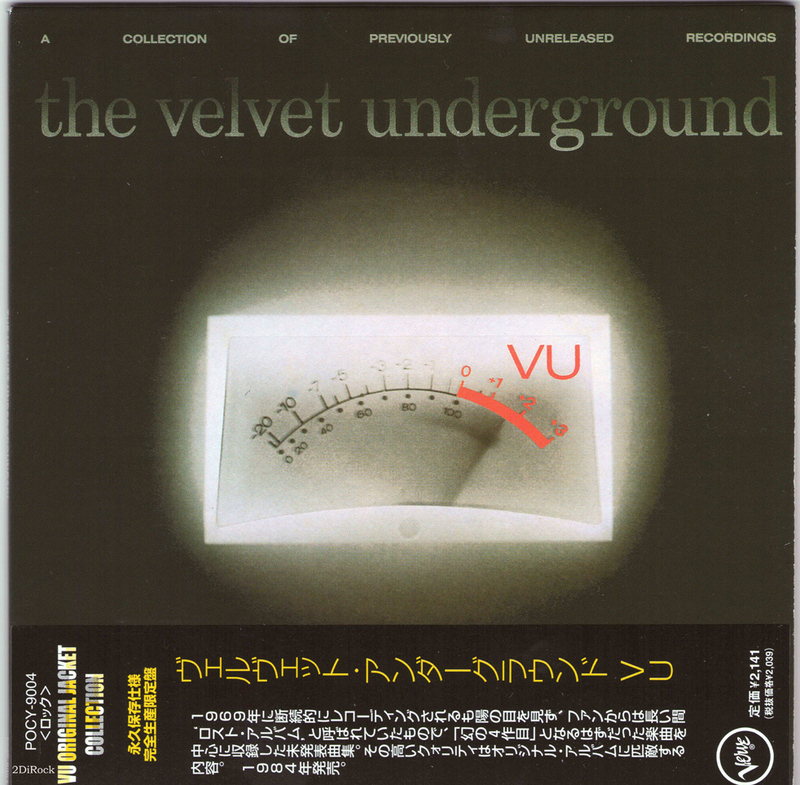 Until the early 80's, the Velvet Underground story had ended with Loaded (except for posthumously issued live albums and shoddy compilations). But the release of V.U. is a major event, because its ten previously unissued tracks – bootleg appearances not with standing – constitute the missing link between the band's late-Sixties mood swings and Loaded's commercial near-breakthrough. Except for two songs recorded with John Cale in 1968 (Doug Yule replaced him later that year), the material on V.U. 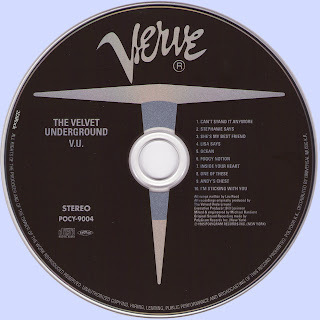 is the bulk of a projected fourth Verve/MGM album that was never finished; it became known among fans as the Great Lost Velvet Underground Album. refining the edginess of the early records with a polished, accessible sound that doesn't compromise its spirit of adventure.For the first time on record, the Velvets sound like a real band, not a concept in overdrive. "I Can't Stand It" and "Foggy Notion" are proof of this. Both songs are power-drill rockers based on the same urgent pulse as "Sister Ray," the former rolling along with a snotty glide that easily whips Reed's later rerecording on his debut solo album. There are also unexpected flashes of humor – "I live with thirteen dead cats/A purple dog that wears spats/They're livin' out in the hall/And I can't stand it anymore." The real surprise, though, is the way Reed and Sterling Morrison match up as a guitar team. Their creatively rhythmic strumming has a forceful snowball effect, and while Reed tends to take the more spectacular solos, Morrison plays effective fills with sharp, Keith Richards-style intuition. The two songs featuring Cale slot nicely into V.U. 's cohesive tone. "Temptation inside Your Heart" combines playful R&B goofiness with a bright, busy beat and a great strangled guitar solo. The chamber-music pop of "Stephanie Says" is not too distant from that of "Sunday Morning"; still, there is a special resonance in Cale's tiptoe viola and the painful resignation in Reed's voice and lyric ("Stephanie says/That she wants to know/Why she's given half her life/To people she hates now"). The casual horror in so many of Reed's early songs sometimes made it hard to indulge his more reflective moods. But performances like "Stephanie Says" and Reed's charming duet with Maureen Tucker, the childlike "I'm Sticking with You, " show how tender he could really be and how sensitively the Velvets could translate that feeling. Most of the other tracks on V.U. glow with that same vigorous spirit, if not the relentless drive. "One of These Days" is a lively parody of a cowboy drinking song, complete with sagebrush harmonies and a boozy slide-guitar break. "Ocean," a gorgeous evocation of dark ennui, dramatically showcases the Velvets' grasp of Reed's occasional romantic turns.With his thoughtful vocal and Maureen Tucker's imitation on her cymbals of rolling surf, the song anticipates Reed's later epic ballads. A debt of thanks for resurrecting these tracks and for giving the band's first three LPs the proper reissue they've long deserved. As for V.U., the Great Lost Velvet Underground Album is no longer lost. It is simply great. I would be most grateful for mp3 of this one. Thanks so much! Oh, this is a great one, I bought the vinyl when it came out and listened to it over and over! Equal to the earlier VU classics. Really wonderful to have the chance to hear it again; it's been awhile; I foolishly did not retain the records I bought during that period of time. Marios it would be great if you could post "Another VU", I've never heard that one!